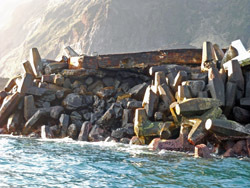 Featuring storm damage to Tristan da Cunha's Calshot Harbour in 2010 and repair work carried out in 2011. Good weather continued and the cranes (gantry as well as the crawler), the dolosse and all the other equipment is now ashore. This is just as well as the weather over the last few days would have made off loading impossible. There have been some teething problems with the crawler crane and to help fix these we have another engineer coming out on The Edinburgh, which leaves Cape Town next week. 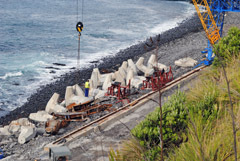 As you can see from the photos, Sea and Shore has started start stitching the dolosse together (they came in two 5 ton halves) but these have to set for a few weeks before they can be placed on the breakwater. 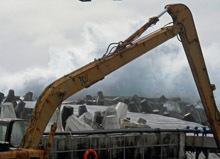 Work has also started on the broken section of the cap at the end of the western breakwater. As soon as the weather clears and she is able to take on passengers, The Baltic Trader will depart for Cape Town returning to Tristan in April to collect the contractors and backload their equipment. So overall, despite a few but inevitable challenges, the project is progressing well. On Friday night (4th February), two days after we had waved good bye to the Governor and the RMS visitors, The Baltic Trader and the Edinburgh both arrived carrying the contractors and equipment for the Harbour Project. Their aim is to place 80 (up from 50) ten tonne dolosse on the Eastern breakwater, which was damaged in the storms last winter. The project, which is costing £6m, is being paid for by the Department for International Development (DfID). These are emergency repairs only and we are still waiting to hear what the longer term solution might be. WSP are the consulting engineers, Apple is in charge of the logistics and Sea and Shore are the contractors. They are all based in South Africa and they (18 personnel) will be here for three months. The repairs must be completed by the end of April when the Baltic Trader (which is being chartered for three months) will return to Tristan to back load some of the equipment and take the contractors back to South Africa. The crane and the new barge will stay here. The first few weeks will be critical as the Baltic Trader is off loaded. There are some very heavy and risky lifts to manage. A large crawler crane, a gantry crane, an excavator, aggregate, 160 half dolosse plus all the other equipment need bringing ashore over the next four weeks. 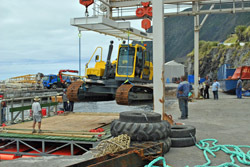 I am pleased to report that during the first few days we were blessed with some wonderful weather, which meant the barge crews (islanders) were able to make good progress with these lifts. They have made a great start but as readers appreciate, the weather here is variable to say the least...fingers crossed! Although conditions here deteriorated yesterday and today (Saturday) we have quite a swell, the barges are still off loading. I never cease to be amazed at the skill of the barge crews here as they load their barges and then bring up to 18 tons of equipment ashore in one load, navigating the narrow and often rough harbour. This is skilled and dangerous work. We aim to keep visitors up to date with this project as it develops. and below for the 2010 storm damage and official announcement from DfID of the £6m funding. The answer to a question to International Development Secretary of State Andrew Mitchell from Labour MP for East Kilbride, Strathhaven and Lesmahagow Michael McCann was published in Hansard on 3rd December 2010 and can be found on the separate Tristan in Parliament Page. 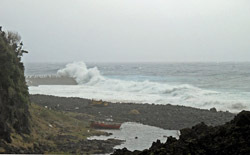 A storm-damaged harbour on the remote British Overseas Territory of Tristan da Cunha is to undergo emergency repairs in an effort to prevent the island from being cut off from its only access to outside supplies and help. The UK Government is to help fix the crumbling Calshot Harbour before the impending southern hemisphere winter storms hit, securing the only gateway to the island for its residents and supply boats. The harbour is vital to one of the most remote inhabited islands in the world but was severely damaged in a storm earlier this year. 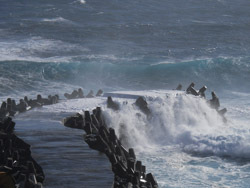 Expert analysis by construction consultants WSP Group has shown that without urgent repair work, the harbour will be at risk of further damage or even being rendered unusable during harsh winter weather in the South Atlantic. 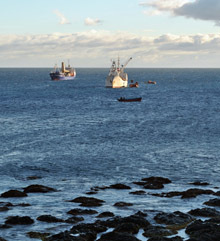 The repair work will help protect the island’s fishing industry, one of its few sources of revenue. 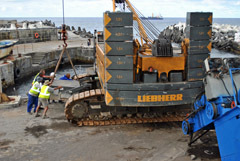 The Department for International Development will procure fifty 10-tonne concrete ‘dolosse’ blocks specially designed to protect the most vulnerable part of the harbour from future storms. 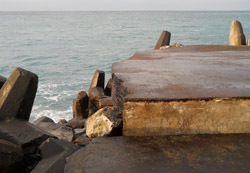 The interlocking blocks are designed to break waves, and deflect their power from the harbour itself. A crane will also be purchased to position them. This equipment will enhance the islanders’ ability to make their own repairs in future. 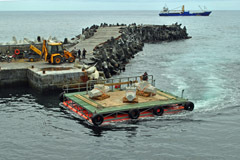 Shipping is the sole means of regular access to the island. Islanders – who have British citizenship – therefore rely on the harbour to survive and make a living. Without a harbour, tourism and fishing – the major sources of income on the island – would be severely reduced. Islanders would not be able to receive regular supplies, cutting off their means of earning a living. 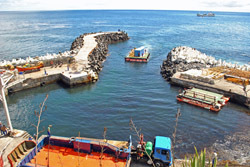 Without this means of generating income, the people of Tristan da Cunha will require a significant extra subsidy from British taxpayers every year. 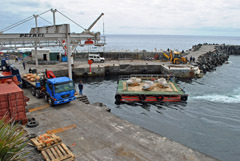 The estimated cost of manufacturing and installing the concrete armour blocks on Tristan da Cunha will be £6 million. Pictures from Marie Repetto below show a sequence of photographs showing storms of 9th August and subsequent shots showing damage to Calshot Harbour's West Pier to supplement the earlier report and pictures below from David Morley. Engineering consultants travelled to Tristan on SA Agulhas and we hope to report of any planned works in due course. Right: A view looking across the lagoon alongside the 1961 lava flow towards Calshot Harbour. The lagoon area has been proposed as an alternative site for the harbour. 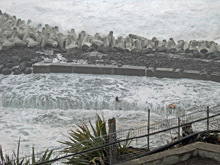 11th August: Swells continue and the damaged concrete block is now visible. 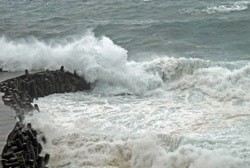 16th August: Waves again sweeping over the Western Breakwater.